Healthy soil and grasses makes for healthy cows and delicious milk and yogurt! Gently cultured in small batches from full-fat, grassfed dairy, milked daily on the farm. This is a European-style yogurt, with a layer of cultured cream across the top. Our yogurt is as rich in health benefits as it is flavor. Non-GMO. Grassfed. Contact us for bulk pricing. What’s in a cup of Pecan Point yogurt? How do you suggest your yogurt be eaten? Why is it important that dairy be grassfed? Added hormones or antibiotics: Do you use them? Is your pasture certified organic? What is the refrigerated shelf life of your yogurt? Do you offer unpasturized milk for sale? What’s makes Pecan Point yogurt special? 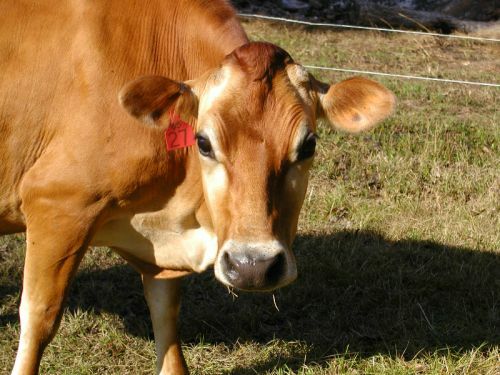 Full-fat, grass-fed dairy, milked fresh from our lovable small herd of pastured, free-roaming Jersey Cows. Through a gentle culturing process in our on-farm creamery, we produce a smooth and mild-tasting yogurt that’s rich in vitamins, essential fatty acids, and beneficial probiotic bacteria. Did we mention there’s a layer of cream on top? How do you suggest the yogurt be eaten? Because our yogurt doesn’t contain commercial stabilizers, characteristic of many commercial brands, we recommend that the yogurt not be vigorously stirred before eating. We suggest simply dipping straight through any additional topping, down through the cream, and then into the yogurt. Enjoy! Cows are ruminants; with their highly-specialized digestive system, dairy cows flourish when eating grass and other plant matter. Put simply, they are healthier on their native diet, and so is their milk. However, today’s conventional dairymen have forgone grass for grain-based feeding with corn or soy. The result is a cheaper product. But we, along with a growing contingent of conscious consumers, believe that such industrial farming techniques sacrifice quality for efficiency. For the sake of taste and our health, we are committed to allowing our cows to eat their full of greens. We do not use any growth hormones, artificial estrus inducers, or antibiotic treatments that would compromise the quality of our milk and, by extension, our yogurt. Officially, we recommend that our yogurt be consumed within one month from the culturing date (stamped on the container). Although, we have ourselves sampled unopened yogurt stored in the refrigerator for upwards of four months, and still find it to be good. The flavor, however, becomes increasingly tart past thirty days from culturing. We offer our milk unpasturized sold under Alabama’s feed milk licensing only. Call or e-mail us for information on purchasing. How do you manage your pasture? The ecological sustainability and economic practicality of our farm, from our pecan orchard to our dairy and beef herds, all depend on a healthy topsoil. For this reason, we focus heavily on nourishing soil microbes. Organic matter and the clovers, forbes, herbs, and grasses that grow on it, all depend on the trillions of microbes in the upper level of the soil. They are critical in enhancing growing conditions. Simply put, when our microbes are happy and healthy, the pasture flourishes. As for specific management practices, among others, we minimize the use of chemical agriculture, keep soil compaction low, compost farm wastes, and using no-till practices whenever possible. As a result, the beef and dairy herds have plenty of high-quality, green plants to choose from. Healthy soil and grasses makes for healthy cows and delicious milk!